A new wave of hope for our forests – our best chance ever? | Collaborate for Change! A new wave of hope for our forests – our best chance ever? What if we could find a way to make the forests more valuable than chopping them down for timber and palm oil? What if there was a way that protecting the forests became the most financially beneficial option for local people – so much so that they would no longer be open to bribes and corruption from the palm oil companies? What if protecting the forests could provide a new energy source that could significantly contribute to solving the global energy crisis, while radically improving the standard of living of the people whose forests are being destroyed and stolen? It seems Dr. Willie Smits may have found a solution to this problem, which could literally change the deforestation game forever. (read a detailed, independent report from Ecofys here). One of the reasons deforestation is so prolific in Indonesia, is because palm oil companies have faced very little resistance from local people in taking their land. Much of this is because the palm oil companies cheat, lie, deceive and even steal land from the traditional landowners. But it’s also because in the short term, the pittance they are paid for their families’ land is too tempting for some people to turn down. So, for a few thousand dollars, and a fist full of soon to be broken promises, the lands these local people have held for centuries are signed over to palm oil companies to destroy. In the short term, such deals can allow the local people to buy fuel for their bikes (there is a massive shortage of fuel in Kalimantan), mobile phones or credit, or other simple luxuries. In the long term, it is the end of their communities, their livelihoods, and their futures. If we as a planet are to reduce deforestation, we need to find an alternative for the local people. A way to ensure the value of keeping the forest in tact outweighs any short term financial tricks the palm oil companies can offer. Sugar Palm is a very exciting option that may be our best chance ever. To be clear – Sugar Palm is the exact opposite of the highly destructive Oil Palm. These trees do not grow in a monoculture – they require the diverse forest to thrive. Because they require the entire forest to be sustained, this sustains all kinds of life, keeping the natural balance of the forest in tact. In palm oil plantations, on the other hand, only the palm oil trees grow. The natural diversity is destroyed – the animals that aren’t butchered and killed are left to starve in a barren biological desert. Sugar palms releases large quantities of juice (up to 50 litres per day). 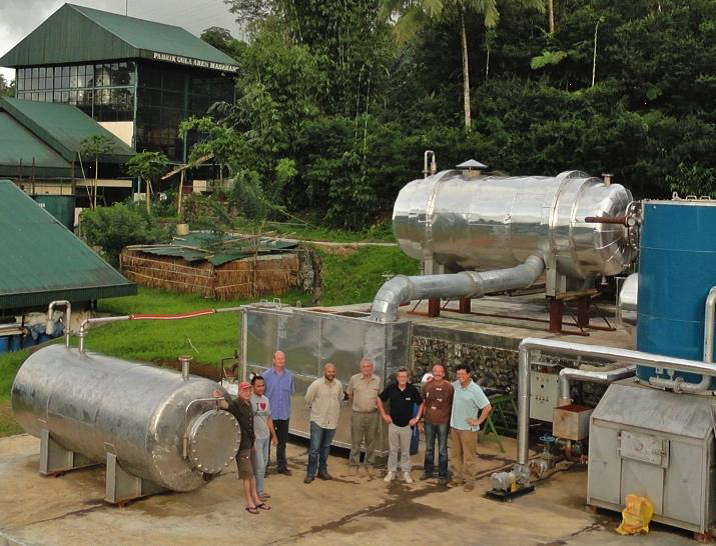 This juice can be efficiently converted into bio-ethanol, palm sugar (low GI), animal feed, electricity, medicines, bio-plastics, and at least 50 additional products created to date using scientific methods developed by Dr.Willie Smits. According to Willie, the amount of energy produced by a sugar palm beats that of all other crops (e.g. it provides over three times more energy than sugar cane). In fact, as far as solar power goes, the sugar palm is a highly effective photovoltaic converter. Local people have been collecting the sugar and using it for medicine, cooking, fire barriers, fiber (rope) construction for years. So what’s new? In this photo, you can see two factories known as “Village Hubs”. The larger one in the background is the original, the much smaller one in the front is a revolutionary new semi-portable factory. Both factories include technology to allow local people to convert their sugar palm into energy, giving them credits that can be used for electricity, clean drinking water, internet access, education service, animal feed, biofuel and more. It is literally a currency exchange centre, allowing sugar to be converted into products and services on the spot. Last week, Willie completed the first ever ‘factory in a box’ version of the Village Hub. The concept is this factory can be transported to anywhere in the world in two large shipping containers. It is then unpacked and assembled and within a few weeks, the entire village can enjoy a substantially elevated standard of living – but ONLY for as long as they have rich, bio diverse forests to sustain the sugar palms. This is fantastic news for orangutans, gibbons, sun-bears and all the other animals that live in the forest. If this takes off quickly, and the demand from the local people drives the establishment of more of these hubs, it is one of the best chances we have to save the forests and the species that live in them. I witnessed Willie present this to over 300 local people in Sintang earlier this year, and if their response was anything to go by, demand will be more than overwhelming. As always, this is about education and free choice. If this works as well on scale as the first production model (this is beyond prototype), and the local people choose this above the alternative (no comparison), this is going to make a significant, positive difference to the planet forever.